Prelude: Challenge at Cybertron Galvatron is a repaint of Universe 2.0 Galvatron, whom I have previously reviewed. It’s been nearly 10 years, though, and looking back I don’t really agree with my then-review all that much anymore, so it’s time to give this mold another go. Robot Mode: Let’s start with this figure’s biggest weak spot: the legs. To put it bluntly, they are a wild collection of parts that do somewhat go together to form something resembling legs, but it all looks very awkward. And not really that much better: Galvatron’s iconic orange cannon aka the tank mode’s turret, which forms the right shoulder and upper arm. The actual cannon is pretty loose and not that easy to pose, while the whole arm-shoulder arrangement is also a jumble of parts. A bit better than the legs, but not much. The rest of the figure is pretty good, though. The toy is easily identifiable as Galvatron thanks to the head and chest and the overall look works pretty good. This special exclusive here is colored mostly a light grey and slightly purple-ish blue, not really Galvatron’s classic colors, but you can still easily tell it’s him. Articulation is good, no complaints, and apart from feeling that a Galvatron should be at least Voyager-sized, I can find no further weak spots here. So bottom line: not exactly a stellar robot mode, but it does look cool at least. Alternate Mode: Galvatron transforms into a light grey tank with an orange gun barrel. This immediately brings to mind the orange safety cap on gun-mode Megatrons, doesn’t it? Anyway, the tank looks pretty realistic and there are no visible robot bits except when looking at it from the back. Here you can spot his robot mode hand on the back of the turret. Not a big thing, though. The gun turret can turn, the tank can roll across the floor. The light grey coloring swallows quite a bit of the detail work on this vehicle, sadly, so this mode looks better on some of the darker-colored repaints of this guy. Still, a fully sufficient tank mode. No complaints here except that it’s somewhat boring. Remarks: This figure is a good example of the different design philosophy between the current Generations series and Universe 2.0, which was the collectors series back in 2008. While today the focus is to recreate the (cartoon) look of the G1 figures as closely as possible, the original Classics and Universe 2.0 lines were instead doing reinterpretations. You could still recognize the characters, sure, but they sported different looks than they did back in the cartoon / comic / G1 toy days. Case in point: Galvatron, who transforms into a human-style tank instead of a futuristic laser gun / artillery thing. 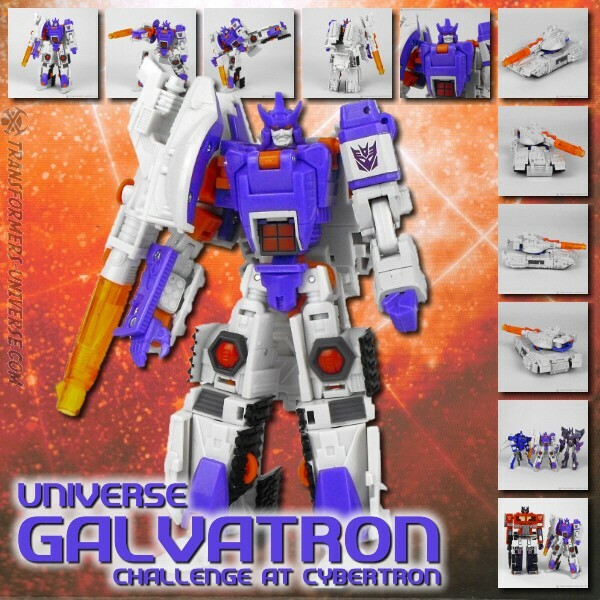 This version of Universe Galvatron was part of the “Challenge on Cybertron” multi-pack along with repaints of Cyclonus and Rodimus. I don’t really remember where or why I bought it, seeing as I already had the standard Galvatron at the time. I’ve sold both of them off, however, as there have been much better Galvatron figures since. Still, at the time (2010), the Universe Galvatron mold was (sadly) the best G1-based Galvatron figure available. So nostalgia might be a reason to buy him, if nothing else. I do not recommend it, however. As I said, there are better Galvatron figures out there than this one.